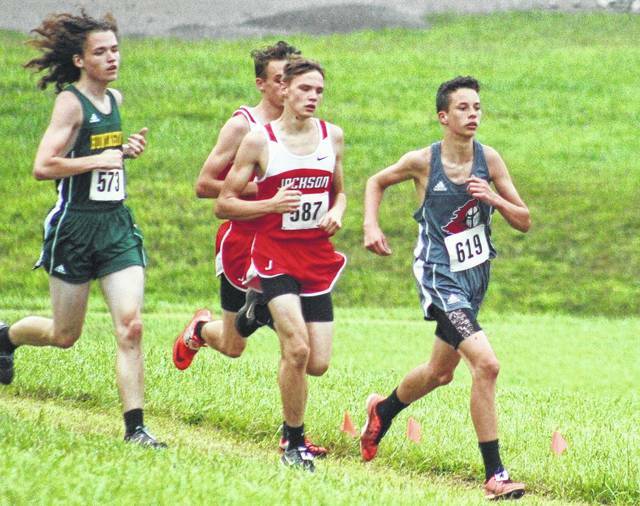 MINERAL WELLS, W.Va. — Both cross country programs at Eastern and Point Pleasant competed, but the Parkersburg boys and Cabell Midland girls came away with top honors Saturday at the 2017 Chick-Fil-A Invitational held at the 4-H Campground in Wood County. Over 400 runners and 53 varisty teams took part in the two varsity events alone, which made for a competitive field in each of the two races. The Big Reds dominated the 32-team boys division after posting a winning score of 78 points, which ended up being 51 points better than the field. Preston County was the runner-up with 129 points, while Cabell Midland was third with 137 points. Point Pleasant finished 25th overall with a final tally of 640 points, but the Black Knights lost a tiebreaker with Buffalo for 24th place after not having a sixth runner compete in the tiebreaking spot. Eastern had only two competitors in the boys event, so the Eagles did not have enough participants for a team score. Aaron Withrow of Winfield came away with individual honors in the boys race, defeating the 226-entrant field by more than three seconds with a winning mark of 15:54.2. Jacob Birurakis of George Washington was the overall runner-up with a mark of 15:57.8. PPHS junior Luke Wilson set his fourth school record in as many events this fall after placing 11th overall with a time of 16:39.2. Wilson had the fastest time of any of the locals competing at the event. Ethan Scott was next for Point with a 123rd place effort of 19:58.7, while Isaac Daniels (20:47.3) and Tanner Durst (22:24.2) respectively placed 147th and 179th. Alex Foster rounded out the Black Knight tally with a 223rd place finish of 31:12.0. Colton Reynolds paced the Eagles with a 38th place time of 17:49.0, while teammate Owen Arix was 59th overall with a mark of 18:18.3. The Lady Knights of CMHS scored a winning tally of 112 points in the girls event, edging out Parkersburg (114) for the team title by a mere two points. Bridgeport was third out of 21 competing teams with 131 points. The Lady Eagles collectively finished eighth with 223 points, while PPHS had only one female entrant in the 183-competitor race. Victoria Starcher of Ripley won the girls individual event with a time of 17:34.9, while Madison Trippett of Parkersburg was the runner-up with a mark of 18:19.1. EHS senior Jessica Cook was the top local finisher after placing 22nd overall with a time of 20:36.1, followed by Ally Durst (20:59.0) and Rhiannon Morris (21:42.7) with respective efforts of 30th and 44th. Whitney Durst was next for Eastern with a 70th place time of 22:38.1, while Kaitlyn Hawk completed the scoring with a 78th place finish. Lexa Hayes (24:02.5) was also 104th overall for the Lady Eagles. Cierra Beatty had the lone PPHS time of 28:37.4 in the girls race, which placed her 164th overall. Visit runwv.com for complete results of the 2017 Chick-Fil-A Invitational. Point Pleasant sophomore Ethan Scott (619) leads a pack of runners during the 2017 Coach’s Corner Classic held on Sept. 5 at Gallia Academy High School in Centenary, Ohio.